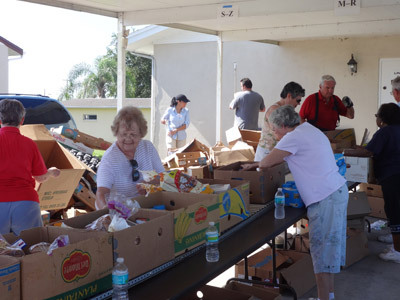 The third and fourth in a series of articles on South County groups benefiting from the “Have A Heart Caring Castle” community food drive co-sponsored by JSA Medical Group, WFLA Ch. 8 and The Observer News, The SCC Observer and The Current. The drive runs through Feb. 28. Clients line up at the Beth-El food bank which serves up to 8,000 people a month. Dave Moore photo. More than 450 families have food on their table every week, thanks to the Beth-El Farmworker Ministry. “During the recession we were serving more than 900 at one point, but it has leveled off and now we serve around 450,” said Javier Izaguirre, operations manager at the group’s food bank for the last 15 years. While not short on donations over the holiday season, it’s those times in between when the needs of local food banks sometimes fade from the public consciousness, a need the Caring Castle food drive addresses. Home to a charter school, thrift shop, adult education classes and legal aid services, summer camps and a nursery, the sprawling 27-acre campus in Wimauma has come a long way from its humble origins in a small house in Ruskin. Founded in 1976 when the Cumberland Presbyterian Church was looking for a place to hold Spanish-language church services, the mission grew out of a desire to help migrant workers. 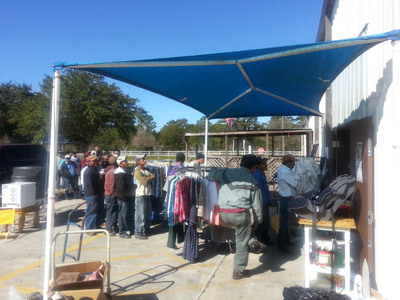 Their need for food, warm clothes and adequate housing — some were sleeping in cars and trucks — was obvious to church members. Beth-El’s mission has grown to encompass education, legal aid and a plethora of support services over the years, but the conditions faced by migrant workers have not changed since the 1960s, when Edward R. Murrow’s “Harvest of Shame” TV documentary put a national spotlight on their working conditions, said Dave Moore, Beth-El’s executive director. “There is not much difference in the lives of farmworkers from 1960 to today,” Moore said. Among the poorest of America’s working poor, migrant workers brave Florida’s heat, working an average of 30 hours a week for only 30 weeks a year. There are often more workers than jobs — and workers struggle just to feed themselves, with families plagued by nutrition-related health problems: low birth-weight babies, anemia in children, and diabetes and high blood pressure in adults, according to Beth-El. Distributing up to 4 tons of food a week, the mission divides that into bags of rice, beans, flour, canned goods, cereal, pasta and bread. For some families, it’s the only food they have for the week. On community donations from the Caring Castle drive, Izaguirre said it all helps. For more information on the Beth-El mission, 18240 U.S. 301, visit www.beth-el.info or call 813-633-1548. The volunteers at the Saint Anne Community Outreach Food Pantry are the real heroes, said pantry manager Paul Wiskitoni. Saint Anne Church photo. Serving the hungry for 16 years, the Saint Anne Community Outreach Food Pantry has worked out of a two-car garage with 60 volunteers serving more than 400 families every week. All that changes next week when the pantry moves into a new 4,000-square-foot building that will feature a walk-in cooler and freezer. The church plans a dedication ceremony for the new building Feb. 14 after the 4:30 p.m. Mass and Feb. 15 after the 10 a.m. Mass. More than 1,000 people in South County have a meal on their table every week, thanks to Saint Anne, with clients lining up every Wednesday from 9 a.m. to noon. “We serve around 425 families a week, but that has been as high as 500,” said Wiskitoni. Second only to the Beth-El Farmworker Ministry, Saint Anne distributes approximately 15,000 pounds of frozen meat a month. The volunteers and those who donate food to the pantry are the real heroes, Wiskitoni said. On donations from the Caring Castle drive — Saint Anne was also a beneficiary last year — Wiskitoni said it all helps. The Saint Anne Food Pantry welcomes volunteers. For more information, call 813-645-1714 or visit www.saintanneruskin.org.